Sports drinks are used by many athletes. They works by replacing fluid and electrolytes. The sugar in the drink helps fuel your body so that you can keep going, longer. Here are the five things you might don’t know about these drinks. Definitely keeps you hydrated but it is horrible for your teeth. A recent research by the University of Tennessee College of Dentistry involved a test to determine the dental erosion impact of several popular drinks. In the study, researchers experimented with several drinks to determine how bad they are for your teeth. Just because it is bad for your teeth doesn’t mean that you shouldn’t drink it. As with most things, moderation is the key. Don’t make sport drink your primary way of staying hydrated. In 1965 one drink contained a toxin called cylamate. At the time, scientists were unaware of cylamate’s toxicity. In 1970 researchers published a study that showed a link between cancer and cylamate in rats. After that was immediately reformulated to remove the toxin. Fortunately, the current formulation does not include this harmful carcinogen. This fact shows, however, that many times food processors are unaware of the dangers some additives can cause. Scientists once recommended that athletes should drink as much water as they can tolerate during exercise. The electrolytes changed the way scientists think about hydration. A recent study outlines the changing hydration recommendations of the scientific community. People following the recommendation to drink as much as possible were actually over hydrating and losing electrolytes. The new approach advocates for an electrolyte and water replacement strategy instead of just water. These drinks hydrates and provides important electrolytes, but it also helps improve endurance exercise performance by supplying your body with fuel. A study in the Journal of Strength and Conditioning Research shows that some drinks improve the rate of muscle glycogen storage in your body. The breakdown of glycogen stored in muscle is the primary fuel for physical activity that lasts less than an hour. That works because it helps you body store more readily useable energy. It’s not just about hydration. A recent study determined that consumption can help you recover faster and perform better during short term intensive exercise. In the study, subjects were given sport drink and a placebo drink. Compared to the placebo, sport drink consumption reduced production of post exercise lactate and glucose levels. Basically sport drink does do one thing, it replaces electrolytes. 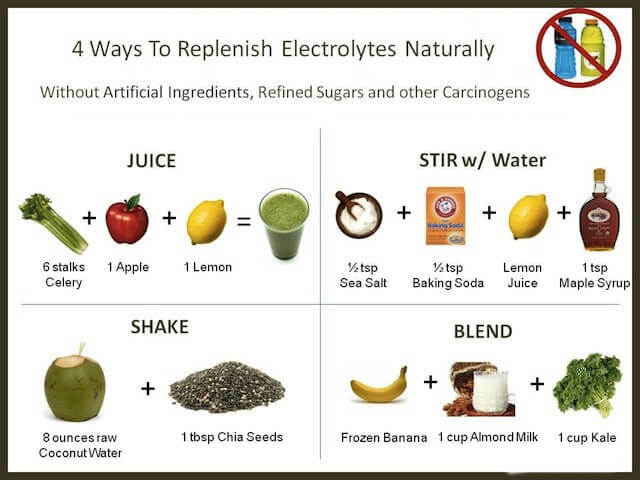 Here are 4 ways to replenish your electrolytes naturally and give your body some serious nutrition at the same time. Remember to choose organic ingredients whenever possible.